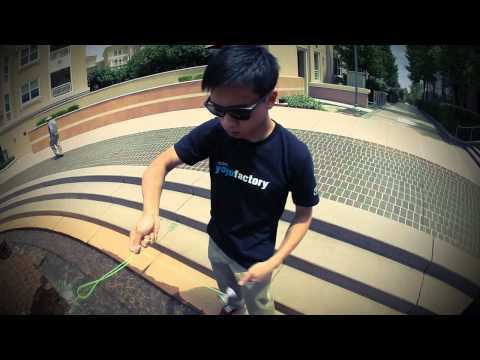 Monster YoYo by YoYoFactory, for the ultimate in wide yoyo performance. The Monster is turning the yo-yo world on its head with its outrageous design. This model is truly a monster! The Monster could be said to be a brother model of the new YYF SuperWide. Despite having the same "wow" factor, the main differences between the Monster and the SuperWide lie in their body shape and materials. The Monster has even more weight pushed to the outer rims, and the slightly smaller diameter gives it rock solid stability and power. Compared to the curvy lines of the SuperWide, the Monster is built with straighter lines, giving it a much different feel both in the hands and during play. This unique model is not just meant to break down barriers holding you back or be a secret weapon at competitions, the Monster is poised to help innovative players invent whole new styles of play. The Monster is especially good for practicing Eli Hop style mounts, increasing your confidence and accuracy before returning to a "normal" yo-yo. This Monster is proudly MADE IN THE USA!